This article is about the North American car model. For models produced for other countries, see Ford Falcon. The Ford Falcon was a front-engine, rear-drive six passenger compact produced by Ford from 1960 to 1970, across three generations. A sales success for Ford initially, outselling contemporary rivals from Chrysler and General Motors, the Falcon was offered in two-door and four-door sedan, two-door and four-door station wagon, two-door hardtop, convertible, sedan delivery and Ranchero pickup body configurations. For several years, the Falcon name was also used on passenger versions of the Ford Econoline van. The Falcon's television marketing featured the first animated appearances of the characters from Charles Schulz's acclaimed comic strip, Peanuts, with announcer contribution from Paul Frees. Variations of the Ford Falcon were manufactured in Argentina, Australia, Canada, Chile and Mexico. Early Mexican built versions of the Ford Maverick used the Falcon Maverick name. Historically, the "Big Three" auto manufacturers (GM, Ford and Chrysler), focused purely on the larger and more profitable vehicles in the US and Canadian markets. Towards the end of the 1950s, all three manufacturers realized that this strategy would no longer work. Large automobiles were becoming increasingly expensive, making smaller cars such as Fiats, Renaults, Toyotas, and Volkswagens increasingly attractive. Furthermore, many American families were now in the market for a second car, and market research showed women especially thought the full-size car had grown too large and cumbersome. At the same time, research showed many buyers would prefer to buy US or Canadian if the domestic manufacturers offered a smaller car with lower cost of ownership. Thus, all three introduced compacts: the Valiant from Chrysler (becoming the Plymouth Valiant in 1961, and joined by a downsized Dodge Dart in 1962), GM's Chevrolet Corvair, and the Ford Falcon. Studebaker also introduced the Lark, and Rambler downsized its near-compact American in 1960. Ford United Kingdom had begun production of the Ford Anglia in 1939, and the earlier Ford Model Y in 1932, followed by the Ford Zephyr, but they weren't sold in North America. Ford of Germany built the Ford Eifel, followed by the Ford Köln which was mechanically similar to the British Model Y, followed later by the Ford Taunus in 1939, but were also not sold in North America. The European Fords, Anglia, Zephyr, and Taunus, were in production at the same time the Falcon was introduced. 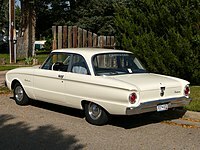 The project which became the Falcon was started and sponsored by Ford General Manager Robert S. McNamara, who commissioned a team to create what by American standards of the time would be a small car but elsewhere in the world considered a mid-size. McNamara, who was promoted to Group Vice President of Cars and Trucks by the time the Falcon was launched, was intimately involved in development, insisting on keeping the costs and weight of the car as low as possible. Engineer Harley Copp employed a unibody atop a standard suspension and sourced parts from Ford's existing bin to keep the price low while providing room for six passengers in reasonable comfort. The sales success of the conventional Falcon along with slow sales of GM's rear-engined Corvair led General Motors to introduce their own compact car based on the Falcon's principles, the Chevy II. The 1960 Falcon was powered by a small, lightweight 95 hp (70 kW), 144 CID (2.4 L) Mileage Maker straight-6 with a single-barrel carburetor. Unibody construction accommodated coil springs front suspension, leaf spring rear suspension and drum brakes front and rear. A three-speed manual column shift was standard, and the two-speed Ford-O-Matic automatic was optional. There was room for six passengers. Body styles included two- and four-door sedans, two- or four-door station wagons, and the Ranchero car-based pickup, transferred onto the Falcon platform for 1960 from the Fairlane. A Mercury rebadged variant, the Mercury Comet, originally intended for the defunct Edsel marque, was launched in the US midway through the 1960 model year. The market shift which spurred the development of the Falcon and its competitors also precipitated the demise of several well-established marques in the late-1950s and early-1960s. Besides the infamous tale of the Edsel, the Nash, Hudson, DeSoto, and Packard nameplates all disappeared from the marketplace. In 1960, Ford's Canadian subsidiary introduced the Falcon-based Frontenac. It was designed to give Mercury-Meteor dealers a smaller model to sell, since the Comet was originally intended as an Edsel, which was sold by Ford-Monarch dealers. Produced for the 1960 model year only, the Frontenac was essentially a rebadged 1960 Falcon with its own unique grille, tail lights, and external trim, including red maple-leaf insignia. Despite strong sales (5% of Ford's total Canadian output), the Frontenac was discontinued and replaced by the Mercury Comet for 1961. Robert McNamara, a Ford executive who became Ford's president briefly before being offered the job of U.S. Defense Secretary, is regarded by many as "the father of the Falcon". McNamara left Ford shortly after the Falcon's introduction, but his faith in the concept was vindicated with record sales; over half a million sold in the first year and over a million sold by the end of the second year. The 1961 model year introduced an optional 101 hp, 170 CID (2.8 L) six, and two new models were introduced; a bucket-seat and console sedan model in a higher trim level called the Futura, and a sedan delivery. Also, the Ford Falcon brochure featured Charlie Brown and Lucy from the Peanuts comic strip who remained until 1965. Ford boasted of the good fuel economy achieved by the six-cylinder Ford Falcon models in advertising. The fuel economy was good, a claimed 30 mpg‑US (7.8 L/100 km; 36 mpg‑imp), compared to other American cars at the time. The 1962 model year had a Squire model of the four-door station wagon with faux wood trim on the sides. The bucket-seat "Futura" model was offered with a slightly upgraded interior, factory-installed safety belts, different side trim (spears), and different emblems. Halfway through the model year, Ford changed the roof line at the back window to more of a Thunderbird design and offered a four-speed transmission for the first time. The two-door Futura sedan (also referred to as an 'illusion hardtop' because of the chrome trim around the side window opening) sported a flat rear window in place of the panoramic (wrap-around) window on earlier models to bring its design in line with other Ford cars of the era. In 1962, Ford introduced the Ford Falcon Club Wagon and Deluxe Club Wagon, an eight-passenger, flat-front, van. Ford also promoted that in a Mobilgas economy run, the Falcon got 32.5mpg. In 1963, even more models were available. There was now a four-door Futura and a Deluxe wagon. Futura Convertible and Futura Sports Convertible models were also included in the 1963 range. Later, hardtops, and the new "Sprint" model were introduced. Halfway through the model year (February 1963), the Fairlane's 164 hp "Challenger" 260 CID (4.3 L) V8 engine was offered for the first time. 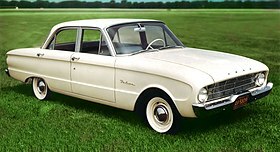 The Falcon was climbing in trim level from its budget beginnings, as Ford attempted to wring more profit from the line. The only time a V8 option was available in a first-generation Falcon was the 1963½ model, and these cars were produced in very limited numbers (Sprint two-door hardtop (bucket seats) 10,479 produced and Sprint convertible (bucket seats) 4,602 produced). These first-generation Falcon Sprint cars were the basis for the 1964½ Mustangs released by Ford one year later. Many (if not most) of the interior, chassis, suspension, and drivetrain components were derived from those used on the 1963½ Ford Falcon Sprint and/or Fairlane models. In simplest terms, the 1963½ Falcon Sprint is nearly mechanically identical to the 1964½ Mustang while being aesthetically different. The second generation Falcon, launched in 1964, featured revised, more squared-off styling. Later in 1964, Ford's new offering for that market was launched: the Ford Mustang, based heavily on the Falcon's unified frame design. TV commercials now used the character Hazel as well as the Peanuts cartoon characters. The Ford Motor Company was a sponsor of the show, and also sponsored The Ford Show during the late 1950s. For the 1964 year, Ford added a Sprint Package, which gave the Falcon the Fairlane's 260 V8, a stiffer suspension, and a louder exhaust. Because the Mustang had the same options that the Sprint had for only a small amount more, the Sprint never caught on. Even with the addition of the 289 V8 in late '64, the Sprint was overshadowed by the Mustang, and was discontinued after 1965. The Mustang dealt Falcon sales in North America a blow from which they would never recover. Front suspension was coil springs pivot-mounted on upper arms plus double-acting absorbers. Six-cylinder cars had four-lug hubs with 13-in steel wheels. V-8 cars got five-lug wheels. For 1965, changes were minimal, including a simpler grille and revised side trim on deluxe models. Production ended on June 26, 1965, for convertible Falcons. A padded instrument panel, power steering, power brakes, a radio, a remote-control trunk release, and a parking brake warning light were optional. From 1965, the three-speed Cruise-O-Matic automatic transmission was available. Front seat belts were standard. 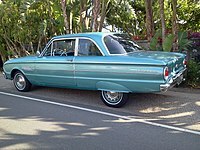 In 1966, Ford launched the third generation Falcon, based on a shortened Fairlane platform with revised styling. At the top of the line was the highly-trimmed Futura Sports Coupe, which featured chrome side window frames, giving this two-door sedan the look of a hardtop. It also featured a premium all-vinyl interior. Large "Sports Coupe" script on the "C" pillar was borrowed from the 1964–1965 Fairlane Sports Coupe. The heater-defroster became standard. Brakes were 9-in for six-cylinder Falcons, and 10-in for V8s. The two-door hardtop and convertible were dropped, while the station wagon and Ranchero were moved to a larger platform shared with the contemporary Fairlane. The Ranchero left the Falcon line and adopted the Fairlane's front sheet metal for 1967. The 1966 Falcon was used in the Trans-Am series. The 1967 models were mostly the same as the 1966s, but more Federally-mandated safety equipment was added, including a dual-circuit brake system, energy-absorbing steering wheel with a large, padded center hub, 4-way flashers, soft interior panels, and mountings for front shoulder belts (which were available as an option). A reminder light was added for the seatbelts; 1968 was the first year for the square tail lights. 1968 and 1969 Falcons got new side marker lights or reflectors, front outboard shoulder belts, and headrests for cars built after January 1, 1969. The basic body and mechanical specifications remained the same as 1966–1967 models. The final model year for the Falcon in North America was 1970. Continuing sales declines and the inability of the car to meet forthcoming safety standards resulted in a short run of 1970 models identical to the 1969 version being built through the end of December, 1969; none of the 1970-model Falcons used a locking steering column that would be standard on all other 1970 Ford products (except Mavericks built before September 1969). "Despite the listing of a plain Falcon series in some early literature, it appears that all Falcons bore the Futura name this year." Although the Falcon, Fairlane, and Fairlane 500, names would disappear, the Futura name would reappear in 1978 on the Fairmont Futura Sport Coupe. On January 1, 1970, the Falcon name was transferred to a low-priced version of the contemporary Ford Fairlane. 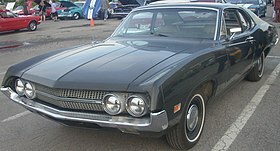 The new model, which was a subseries of the Fairlane series, was marketed as the "Falcon 1970½" and was available as a two-door sedan, four-door sedan, and four-door wagon. Despite the fact that the Maverick two-door sedan had been released in April 1969 as a replacement for the soon to be discontinued "compact" Falcon two-door, Ford went to the trouble of tooling up a unique two-door sedan for the short 1970½ model run. While the number of luxury and convenience options available was limited, the car was available with the full range of Fairlane/Torino power-trains, ranging from the standard 250 cubic-inch six-cylinder and 302 cubic-inch V8 all the way to the 429 Cobra Jet V8. ^ "1961 Ford Falcon Peanuts commercial". Youtube. Retrieved 4 February 2017. ^ "1971 Ford Falcon Maverick (Mexico) p1". Flickr.com. Retrieved 17 May 2014. ^ "Directory Index: Ford/1960_Ford/1960_Ford_Falcon_Brochure". Oldcarbrochures.com. Retrieved 2011-11-20. ^ "1960 Ford (U.S.) Falcon Base 2-Door Sedan (Tudor) performance data, specs & photo". Automobile-catalog.com. Retrieved 2011-11-20. ^ "Directory Index: Ford/1963_Ford/1963_Ford_Falcon_Brochure". Oldcarbrochures.com. Retrieved 2011-11-20. ^ "Directory Index: Ford/1961_Ford/1961_Ford_Falcon_Brochure". Oldcarbrochures.com. Retrieved 2011-11-20. ^ "Directory Index: Ford/1965_Ford/1965_Ford_Falcon_Bruchure". Oldcarbrochures.com. Retrieved 2011-11-20. ^ "Directory Index: Ford/1962_Ford/1962_Ford_Falcon_Brochure". Oldcarbrochures.com. Retrieved 2011-11-20. ^ a b c "Directory Index: Ford/1964_Ford/1964_Ford_Falcon_Brochure". Oldcarbrochures.com. Retrieved 2012-05-28. ^ "1964 Ford Falcon starring Hazel". Youtube. Retrieved 5 February 2017. ^ "Directory Index: Ford/1964_Ford/1964_Ford_Falcon_Brochure". Oldcarbrochures.com. Retrieved 2012-05-28. ^ "Directory Index: Ford/1965_Ford/1965_Ford_Falcon_Bruchure". Oldcarbrochures.com. Retrieved 2012-05-28. ^ "Directory Index: Ford/1967_Ford/1967_Ford_Falcon_Brochure". Oldcarbrochures.com. Retrieved 2011-11-20. ^ a b c "Directory Index: Ford/1966_Ford/1966_Ford_Falcon_Brochure". Oldcarbrochures.com. Retrieved 2011-11-20. ^ "Directory Index: Ford/1966_Ford/1966_Ford_Falcon_Brochure". Oldcarbrochures.com. Retrieved 2012-05-28. ^ Dammann, George (1993). 90 Years of Ford . Osceola, Wisconsin: MBI Publishing Company. p. 428. ISBN 0-87938-682-7. ^ Dammann, George (1993). 90 Years of Ford . Osceola, Wisconsin: MBI Publishing Company. p. 492,499. ISBN 0-87938-682-7. 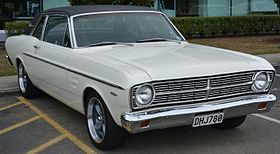 Wikimedia Commons has media related to Ford Falcon (North America).